Andreas Harsono: Can Prison Songs Help Heal the Wounds of Indonesia’s 1965 Massacre? Can Prison Songs Help Heal the Wounds of Indonesia’s 1965 Massacre? You arrived, my child, in the darkness of misery. You cried, but your father did not hear you. Only with your mother’s tears, noble tears, embracing you. You came to life with many wounds. In Indonesia, several hit songs, beautiful and powerful, were actually written inside prison cells. The songs originated in 1965 when military-led massacres and round-ups left 500,000 or more alleged communists and communist-sympathizers dead and hundreds of thousands more in prisons and prison camps. Fifty years ago, a campaign of mass slaughter was started in Indonesia. On the evening of Sept. 30, 1965, military officers kidnapped and killed seven army generals in Jakarta. They argued that they wanted to save the then-president, Sukarno, from a planned military coup attempt. The army responded by attacking the Indonesian Communist Party ( PKI) — and anyone seen as connected to or sympathetic to the PKI — accusing the PKI of being involved in the murder of the generals. Military propagandists claimed that pro-communist women were partying, half naked, while mutilating the bodies and dumping them in a well, claims later shown to be fabricated. The military prepped journalists to paint all communist sympathizers as atheists, a serious social stigma in predominantly Muslim Indonesia. Then the real hunt began. Special Forces units arrested alleged communists, labor and farmer activists, leftist intellectuals, artists and teachers. Muslim militias killed them and dumped their bodies in rivers or buried them in mass graves on plantations. Thanks to Oppenheimer’s films, more people, especially outside Indonesia, are aware of the mass killings, but fewer people know of the fate of the political prisoners — up to 100,000 of whom were held well into the 1970s. These victims of the same anti-communist purges were not killed, but carted off to remote prisons in Indonesia, where they suffered torture and imprisonment for decades. Bali, the white-sand-and-serene-temple island popular with foreign tourists, is the site of Pekambingan prison where up to 400 political prisoners were imprisoned between 1965 and 1977. They wrote songs and sang to survive their torture and their uncertain fate. Ida Bagus Santosa, a Balinese intellectual, wrote about how he missed his wife and their baby daughter, when the military arrested and jailed him without trial. He wrote their nicknames on his cell, “Tini and Yanti,” asking them not to be upset and not to lose hope. In December 1965, prison guards brought Santosa out of his cell, handing him over to “men in black” who took him away. He never returned to the prison or his family. Tjiptaprawira also wrote “Si Buyung” (My Only Child). A song about his wife, who was pregnant with their only child, when the military arrested him. Another prisoner, Ni Ketut Kariasih, who was jailed three times between 1965 and 1977, wrote about her loneliness after her husband was arrested and forcibly disappeared. Punk rocker I Gede Ari Astina a.k.a. Jerinx of the Superman Is Dead band, recorded this ballad “Di Kala Sepi Mendamba” (When Feeling Lonely). The jailings began to generate international concern and in 1977 newly elected US president Jimmy Carter asked president Suharto, a former general who had led the anti-communist campaign, to release an estimated 55,000-100,000 political prisoners. Jakarta, still dependent on US aid and support, reluctantly released them all by 1979. In 1983, Pekambingan prison was demolished. The site was used to build a shopping mall. But the songs survived the Suharto regime. In 1998, Suharto stepped down from power and a slow democratization process began in Indonesia. Indonesian prison songs from the 1960s and 1970s started to emerge on YouTube. Young musicians in Bali, then later in Jakarta, embraced the songs, singing them on TV, and talking about the 1965 mass killings. 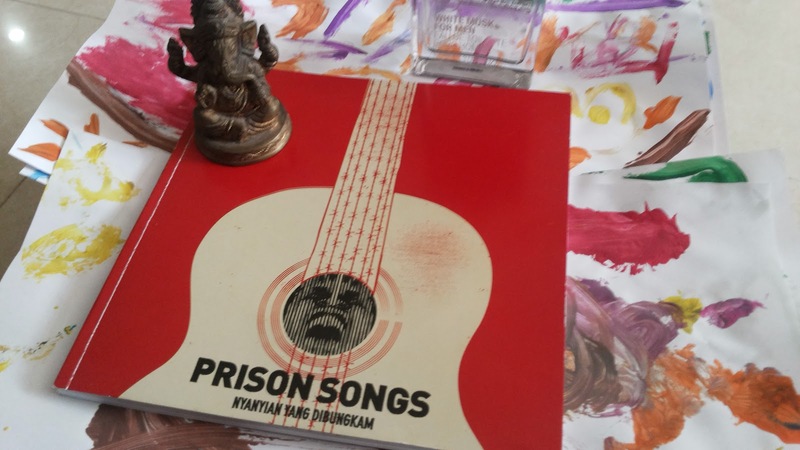 Taman 65, a community of artists and activists, released an album of prison songs in July of this year. Indonesia has struggled to address the legacy of 1965 and its aftermath. There has been no truth commission, no trials, no redress for the many victimhttp://jakartaglobe.beritasatu.com/opinion/commentary-can-prison-songs-help-heal-wounds-indonesias-1965-massacre/s. In August, President Joko Widodo announced a plan to set up a “reconciliation commission” to find a “permanent solution for all unresolved human rights abuses” of the past 50 years, including the 1965 massacre— but left out details. He backed off when the military and some Muslim organizations widely opposed the idea. In the face of continued intransigence by successive Indonesian governments, the release of the 1965 songs of political prisoners is a vivid and moving reminder of the horror of 1965. It is important to keep the memories of these victims alive until their families can see justice done. Andreas Harsono is senior Indonesia researcher at Human Rights Watch.